The mood of the sensuous and provacative world of an Argentinian tango is wonderfully captured in this work. Salon Argentina is also known as Not Just a Place which was commissioned by Duncan McTier as a trio for viola, double bass and piano and first performed by the Fibonacci Sequence in November 1999 at Aberystwyth University. Later, the London Mozart Players commissioned a rescoring of the trio for violin and double bass solo and string orchestra which was premiered by David Juritz (violin) Leon Bosch (double bass) and the strings of the LMP in December 2001 at St Michael and All Angels, Chiswick, London. The British Composer Awards 2005 are presented by the British Academy of Composers and Songwriters in association with BBC Radio 3 and sponsored by the Performing Right Society. 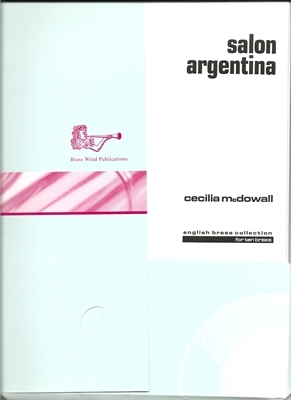 Cecilia McDowall has been shortlisted in two categories, her motet Regina Caeli in the Liturgical section, and the large-scale setting of Stabat Mater for the 'Making Music' Award. Making Music is the body which represents hundreds of amateur choirs, orchestras and music clubs throughout the United Kingdom. The winners are to be announced on Friday 9th December 2005.